Flat Transmission Belt – Standard Industrial Inc.
Flat transmission belt is a common flat rubber belt, also called transmission belt, usually uses high-quality cotton canvas as its skeleton layers. 1. 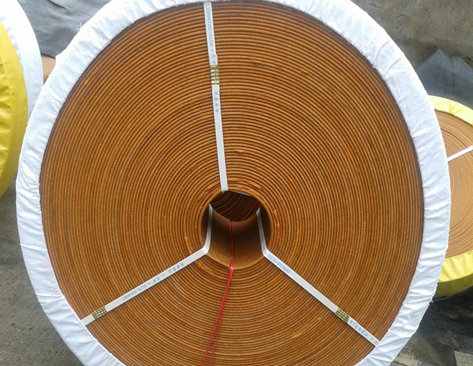 The flat rubber belt has the characteristics of high strength, good flexibility and small elongation. 2. Innovative design, adopting advance rubber compound with good adhesion at opposite joint of surface fabric with fillet, delaminating will not occur during operation. 3. Adopting high quality pure cotton canvass, the duck plies have good endurance and will not easily deform. It is mainly used in factories, mines, docks, metallurgical industry, ordinary mechanical power transmission, great power processing of grains like rice and wheat, irrigation equipment, wood cutting and other power transmitting equipment for industry and agriculture. 1. Category: 28 OZ(ounce), 30 OZ(ounce), 32 OZ(ounce), 34 OZ(ounce) and 36 OZ(ounce). 2. 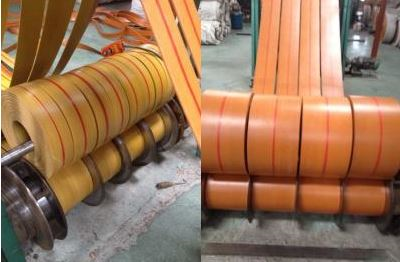 Cut edge flat rubber belt: Cut edge flat rubber belt is manufactured by adhering several layers of full width canvas together, the sides of the belt are surfaces formed by cutting, the belt edge surfaces are coated with rubber paste. 3. Round edge flat rubber belt: Round edge flat rubber belt is folded by the outer ply or plies of canvas, and the sides of the belts are curved surfaces. 4. Available in variety of colors, mainly of them have four colors: light brown, yellow, orange and black.